St Mary’s Square has no street lighting other than that from nearby street lamps in St Mary’s Road. 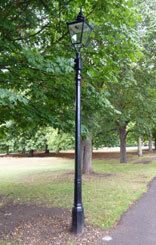 The society has proposed that one of the surplus cast-iron columns from elsewhere in Ealing should be restored and reinstalled at this location with a Victorian lantern. The cost will be met by the local Ward Forum. The end result will be similar to the restored columns in Hanwell (see photo).